1. Email claims to be from Visa asking you to confirm your account data by clicking on the link. You will be taken to a spoof login page where your details will be captured by the phishers. 2. 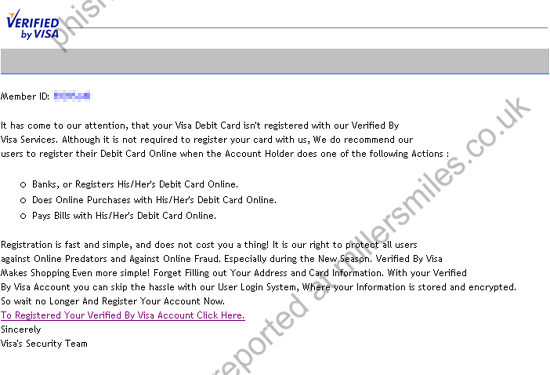 Visa never send users emails requesting details in this way. 3. URL obviously not Visa ! 4. Website traced to Paris, France. 5. URL is disguised as text " To Registered Your Verified By Visa Account Click Here. " " Member ID: x It has come to our attention, that your Visa Debit Card isn't registered with our Verified By Visa Services. " Not online at time of report, but likely to closely resemble the real VISA site.